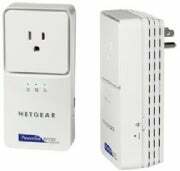 Home networking giant Netgear plans to introduce a 500 megabit-per-second line of HomePlug AV powerline products this fall. Netgear announced a slew of products, including next-generation powerline and advanced multimedia-optimized Wi-Fi products this week at CeBIT, the giant tech trade show in Hannover, Germany. The Powerline AV 500 Adapter Kit (XAVB5001) and the Powerline AV+ 500 Adapter Kit (XAVB5501) will be among the first to comply with the IEEE draft P1901 standard for powerline products. Current HomePlug AV products are rated to top out at 200mbps (but real world speeds are more in the 100mbps range). Powerline products use existing electrical circuitry and therefore require no additional network wiring; they are also generally more reliable than wireless for streaming media. kits both include two adapters that connect to electrical wall sockets at one end and Ethernet ports on the other. To set up the network, you plug one adapter into a free LAN port on any standard home networking router; after that, you can use the second adapter to add any device with an Ethernet port to your network. You can then buy more adapters to add additional devices. Powerline AV 500 adapters are compact in design (Netgear says they're intended to avoid covering a second outlet at the location where they are connected). Powerline AV+ 500 adapters include a pass-through socket, so that you don't have to sacrifice an outlet for exclusive network use. 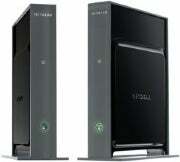 Netgear also announced new 802.11n Wi-Fi products designed for home theaters and gamers. The High-Performance Wireless-N HD Home Theater Kit (WNHDB3004) consists of two Wi-Fi ethernet adapters-one to plug into an existing router, the other to any ethernet-equipped home theater component (e.g. an HDTV or Blu-ray Disc player). It differs from most Wi-Fi adapters in that it offers four-by-four antenna signal processing (most 802.11n products top out at three by three) on the 5GHz band (which is less subject to interference than the 2.4GHz band, where Bluetooth, microwave ovens, some cordless phones and most older Wi-Fi gear compete for scarcer bandwidth). The kit is slated to ship this fall; pricing has yet to be determined. The Universal Wi-Fi Internet Adapter (WNCE2001), meanwhile, is the first 802.11n Ethernet adapter that can be powered by a USB port on a TV, game console, or other consumer electronics device. The idea here is to avoid having to run a separate power cable from a game console or HDTV. Netgear says the adapter will arrive in May with a suggested retail price of $79.